These music trolleys are mounted on castors for easy mobility and are available for a free UK mainland delivery within 2 weeks from order. Available in Red, Blue and yellow or a Beech finish depending on preference. 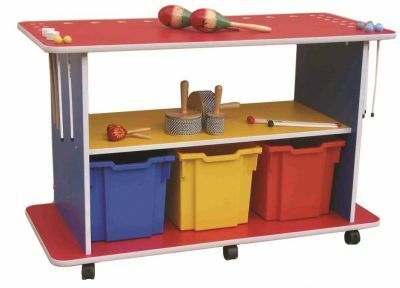 These mobile storage units are available with a multicoloured carcass in Blue, Red and Yellow as well as a bottom shelf that is used for effective storage of musical instruments. Available for a free UK mainland delivery, these music trolleys also come with 3 extra deep trays that are available in Yellow, Red and Blue. Delivered for free within 2 weeks from order.